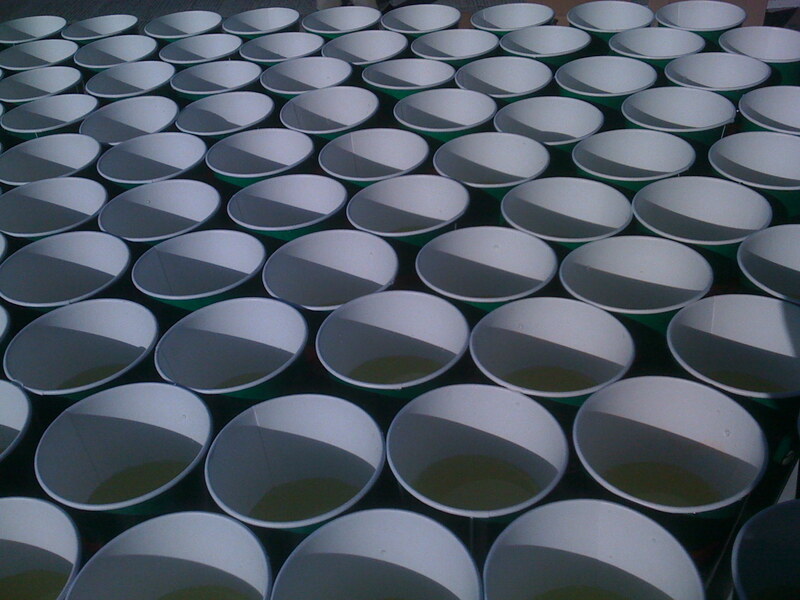 Volunteering at the Marathon – Gatorade, anyone? T and I volunteered for the Chicago Marathon on Sunday morning, waking up at 5:45 am and filling up over 1,000 cups of Gatorade in preparation for the onslaught of runners at the finish line. There were an additional 15-20 other tables stocked 4 levels high for approximately 20,000 cups of Endurance Formula Gatorade (2 jugs of water to 1 jug of concentrate was the recipe for the still too sweet energy drink). So, after the debacle last year and the Olympic bid looming, Chicago was ready and prepared for the 80+ degree heat that once again plagued the 26.2 mile race. Interestingly, one drawback of all that preparation was that the Gatorade ended up tasting hot as a result of sitting under the sun for 3+ hours. Sorry, runners. T and I did try to pour fresh/cool Gatorade to all of our runners, and other tables started to do the same. Great job to all who beat the heat!